If you’re creating an order form for your e-commerce store, then you’re likely to want a WooCommerce one page checkout too. The problem is that the two don’t normally go hand in hand. On one hand, there are plenty of WooCommerce order form plugins that don’t have a one-page checkout. On the other hand, the average WooCommerce one page checkout plugin puts the buying process on a single page, but doesn’t display products in a way that maximizes conversions. 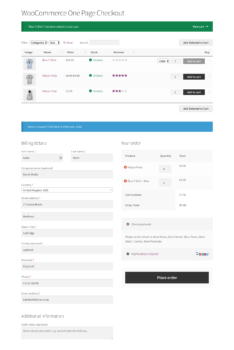 For example – the official WooCommerce.com plugin for one page checkout lists products in a very basic way. 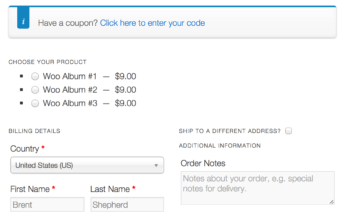 It’s fine for displaying one product or a small number of products with a checkout form underneath. However, it’s completely useless for using many products with WooCommerce one page checkout. And if you want to enable your customers to search, sort and filter the list of products, forget it. That’s where WooCommerce Product Table comes in. This bestselling plugin lists products in a more sophisticated table-based order form. You can list hundreds or even thousands of products, with quick search, sort and filters so that customers can easily find what they want. They can then scroll down below the table and checkout, directly on the order form page! Keep reading to learn how to set up the Product Table plugin with WooCommerce one page shopping. There are full written instructions, plus a video tutorial. Create a one page checkout plugin for your WooCommerce store today! Why do I need a WooCommerce one page checkout plugin? Before we get started, it’s worth thinking about whether your WooCommerce store actually needs one page checkout. There’s a very basic principle behind letting customers choose products and complete their purchase on a single page. It’s all about reducing the length of the order process, speeding up the customer journey. Research shows that 10% of abandoned carts happen because the checkout process is too long. Customers simply get fed up and go elsewhere! The number of clicks is a big factor. The more pages the customer has to click through to make a purchase, the less likely they are to complete it. You can speed up the buying process by listing products on the same page as the WooCommerce checkout. This helps to increase conversions, resulting in more sales for you. You’re happy, the customer’s happy – everyone wins! 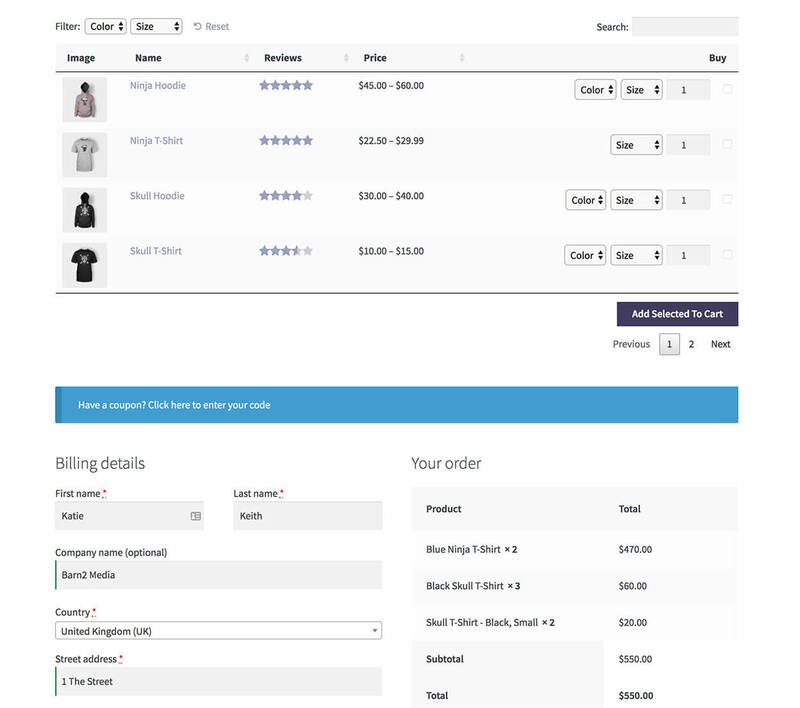 Demo page: See a WooCommerce one-page checkout in action. How does WooCommerce Product Table work with one page checkout? 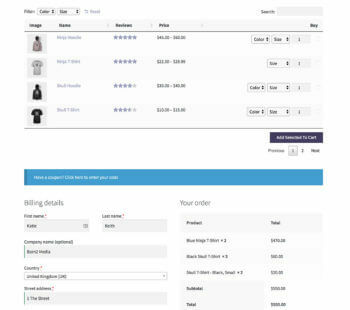 You can use one page checkout with our WooCommerce Product Table plugin. I’ll tell you how to do this in a minute. The customer visits a page which lists some or all of your products using WooCommerce Product Table. They use the table’s search, sort and filters to find the products they like, tick the ones they want to buy, and then click the ‘Add Selected to Cart’ button. Once there are products in the cart, customers can check out on the same price via a WooCommerce checkout directly below the product table. The customer just needs to scroll down to the one page checkout where they review their order, add their name and address, choose shipping and payment methods, and complete the purchase. And if you’re using the official One-Page Checkout plugin, then customers can even edit and delete products without clicking elsewhere. All on one page! So far, you’ve learned why your store needs a WooCommerce one page checkout plugin. You also understand how it speeds up the customer journey by letting customers choose products and purchase from a single order form page. Next, I’ll tell you how to set it up. Method 1 – Use the official WooCommerce One Page Checkout extension to add a more sophisticated checkout under your product tables. 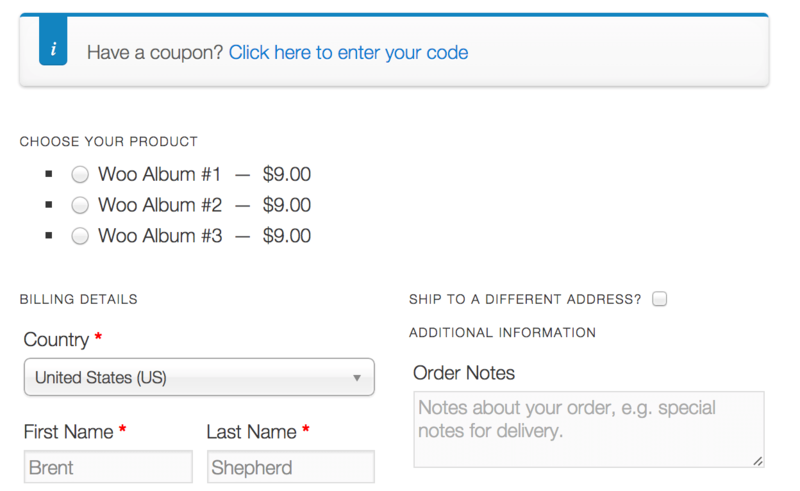 Method 2 – Create product tables with the default WooCommerce checkout underneath. 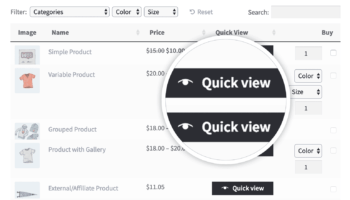 If you want customers to be able to access extra product information without being taken away to the single product page, then you can use the WooCommerce Quick View Pro plugin to add quick view links or buttons to the product tables. Use method 1 if you want customers to be able to remove products and change quantities from within the one page Woo checkout. You’ll also need method 2 if you want the checkout to be visible even when the cart is empty (with method 2, the checkout magically appears after products are added to the cart). You can use the official WooCommerce One Page Checkout extension to add a more sophisticated checkout under your product tables. You should choose this option if you want to enable customers to change quantities and remove quantities from the checkout form. This plugin comes with some product layout options which you can use to list your products above the one-page checkout. However, these are pretty basic. For example, you can’t list large numbers of products or add a search box or filters to the list. The plugin’s developer recommends it for listing a few products. That’s why you need to use the WooCommerce One Page Checkout extension with WooCommerce Product Table. The Product Table plugin adds more sophisticated options for listing your products. You can choose which columns of information to include, add product variation dropdowns, and even add search box and filters. The lazy load option lets you list hundreds or even thousands of products, neatly separated by pagination links. And all this appears directly on the one page checkout. It’s true one-page shopping, regardless of how many products you have. I’m assuming you already have a WordPress website with the free WooCommerce plugin installed and some products added. You can then implement one page checkout using the following instructions. Get WooCommerce Product Table and install it on your site (Plugins -> Add New). Once activated, head to WooCommerce -> Settings -> Products -> Product Tables and enter your license key. DO NOT tick the ‘Ajax Cart’ option for the ‘Add to cart behavior’ option. By leaving this box unticked, the page will reload when customers add products to the cart, displaying the one page checkout underneath with the correct products. If you want to list lots of products, you’ll probably want to choose the ‘Checkbox’ add to cart option. This adds a neat multi-select option so that customers can add lots of products to the cart at once. If you’re selling variable products, then choose either the ‘dropdown’ or ‘separate’ variation options. This lets customers choose variations directly in the order form instead of having to click through to the single product page (which would defeat the purpose of a WooCommerce one page checkout!). Tick the ‘Quantity’ options so that customers can buy more than one of each product/variation. If you want to prevent people from leaving the one page order form and clicking through to the single product page, add ‘none’ for the links option. This disables links to the single product page. I recommend keeping the number of rows per page fairly low so that customers don’t have to scroll too much to view the checkout under the table. If you have more products than the number of rows, then pagination links will appear under the table so that they can view more pages. At the top of the page, add some simple instructions for your customers. This should be a friendly sentence telling them to choose their products, add them to the cart, and then scroll down to checkout underneath. Add a shortcode to the page: [product_table]. You can add this using the Classic WordPress editor or to a Gutenberg block. This will list all your products with the options you chose on the plugin settings page. There are lots of options to edit the shortcode, for example if you want to list specific products only. You can add as many product tables as you like to the page – just add the shortcode more than once. Add the following shortcode underneath the product table shortcode(s): [woocommerce_one_page_checkout]. This will create a WC one page checkout with a product table at the top, and the checkout form below. This is the checkout shortcode provided by WooCommerce itself. And more importantly, here’s what it looks like in the front end! The checkout will be hidden until the customer adds products to the cart. Once they add products, the checkout will show underneath. This will include the payment methods and shipping options you’ve configured in the global WooCommerce settings. Note: With method 2, customers will not be able to edit or delete products in the one page checkout – the list of products in the cart is read-only. You’ll need the extra plugin described in method 1 if you want this. If you set up WooCommerce Product Table with one-page checkout and it’s not working, then try adding a product to the cart. If the page does not reload, then this is the problem. You must disable Ajax add to cart in order for the checkout to update when you add products to the cart. Do this by unticking the ‘Ajax Cart’ option on the WooCommerce Product Table plugin settings page. If the page is still not reloading when you add products to the cart, then go to WooCommerce > Settings > Products and untick ‘Enable AJAX add to cart buttons on archives’. Can I disable the WooCommerce cart completely? The cart link will still appear in your navigation menu and/or header (depending on your theme and menus). When the customer adds products to the cart, they will see a success message linking to the cart. If your WooCommerce order form page includes a sidebar with the ‘WooCommerce Cart’ widget, then the contents of the cart will show after they add products. This widget includes links to the cart and a separate checkout page. It’s absolutely fine to use these features alongside one page checkout. It gives customers a choice. For example, if they want to edit the contents of their cart then they can click through to the cart page and check out afterwards. This is handy because the WooCommerce one page checkout lists the products in the cart without any means to edit them. The simplest solution is to add a 301 redirect to stop people from accessing the cart page. You can do this by installing the free Redirection plugin and redirecting the cart page to wherever you like. For example, you might redirect the cart page to the WooCommerce checkout. This is the checkout page defined in the WooCommerce settings, and is separate from the page where you’ve added a product table. Alternatively, you could add an anchor link to a point underneath the product table on your one-page checkout page, and create a redirect so that people are taken there when they click on a cart link. When a customer adds a product to the cart and sees the success message with ‘View Cart’ link, clicking it will scroll them down the page to the WooCommerce one page checkout under the product table. For a more comprehensive solution, you can write some custom CSS to code hide the success message and all the cart links. We have partnered with Codeable to provide customization services for our plugins. If you don’t know how to hide the cart links yourself, then I recommend posting a job on Codeable and their WordPress experts will send you a quote. Get the best WooCommerce one page checkout plugin now! You can choose exactly what information to display about your products. Customers can find specific products quickly and easily, even if you’re listing a large number of items. You can reduce abandoned carts by displaying the WooCommerce checkout directly below the product order form. To get started, install WooCommerce Product Table today. Follow the instructions above to add one page checkout to your own WooCommerce store.